Growing up in an immigrant family in Calgary during the ‘80s was a tough gig. Especially in the school lunchroom. I was the Chinese kid with the weird and “smelly” food. I always dreaded 12:05pm each day. Brrrring went the lunch bell. While the other kids had the brown bag staple, PB&J or bologna and mustard sandwiches, I had anything other than that. No one ever wanted to swap lunches with me. Not even the boy with the squashed tuna sandwich. You see, I didn’t have a plastic Barbie lunch box or a brown paper bag. My lunch lived inside an insulated thermos jar. All eyes would be on me as I unscrewed the lid to see what kind of smelly goodies awaited. Pop! As I removed the cap from the thermos, a pungent smell wafted out. I would prepare myself for the chorus of “eeewww!” and “what’s that?” One day it would be beef with bitter melon in black bean sauce, the next day it would be fried rice laced with fish sauce. I (and the tuna sandwich boy) had the “fear factor” lunches of our times. Although the smell crinkled many noses, I remember them being utterly delicious. I always contemplated why my fellow fourth graders got freaked out with the idea of ingesting bacteria and wild yeasts. Maybe they didn’t know that eating fermented food is beneficial to your intestinal flora. Perhaps they needed a lesson or two on the nature of fermentation. Explaining fermentation, even to a fourth grader, is (relatively) simple. Take any food group, place it in a room temperature environment and let it sit for days, weeks, or months. Voila, fermentation! The beneficial microorganisms (yeasts, moulds and bacteria) must be protected from the growth of dangerous bacteria (pathogenic microorganisms). Creating a salty environment, adding a starter culture, eliminating oxygen or increasing the acidity (adding vinegar) are all ways to prevent spoilage during the process. As the reaction progresses, sugars and starches are converted into alcohol (lactic acid bacteria) and acid (acetic acid bacteria). What you are left with is a food that has gone through a “makeover.” And it’s actually a more nutritious version of its original form. Packed with a multitude of vitamins and probiotics, fermented foods provide enzymes that boost digestive health. Humans have been fermenting foods for centuries. The earliest evidence dates back to 6000 BCE in the Caucasus region. The Georgians were the first to produce a fermented beverage, aka wine (God bless them!). The millions of Chinese workers drafted to build the Great Wall over the course of 2,000 years, would snack on fermented mixed vegetables during its construction. In ancient times, fermentation (along with smoking and drying) was a widely practised food preservation technique. Cultures around the world have created unique flavours and traditions based around fermented food, including the ubiquitous sauerkraut. Asian civilizations have a history of fermenting a wide variety of foods including kimchi, douchi, miso and fish sauce. These condiments have all remained essential components of far Eastern cuisine. Get your taste buds ready as I take you on a journey to the pungent world of fermented deliciousness! Kimchi is not just for Koreans anymore. 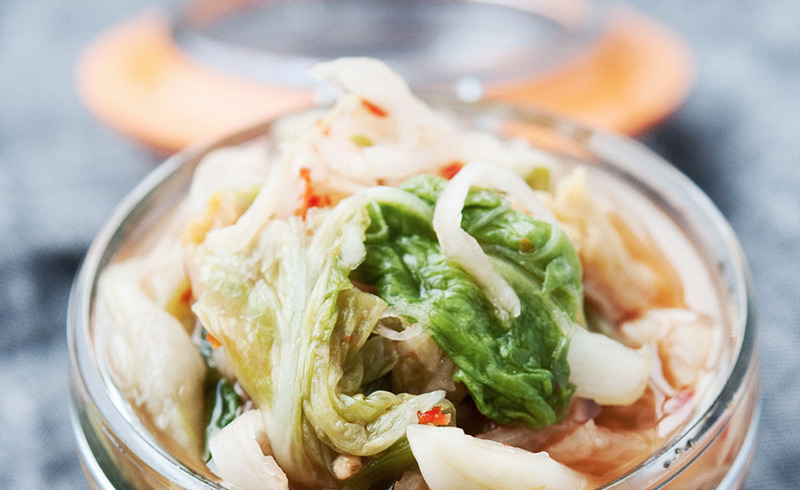 This spicy, sour and garlicky fermented cabbage has big buzz in the international food scene. It is made from salting and fermenting Napa cabbage (radish or cucumbers are also used) with garlic, ginger, chili flakes, and green onion. To help kick-start the fermentation process, seafood is added to the mix — salted shrimp, fish sauce, or oysters. Traditionally, Korean families would prepare enough kimchi to last the long winter. It would then be stored underground in large clay jars to maintain the optimal fermentation temperature. Today, most Koreans dwell in apartments, with no backyards to bury the jars. Enter the kimchi refrigerator. This fridge mimics the conditions of a clay pot buried in the ground and has different temperature controls and fermentation settings. I understand having a separate fridge for my wine and beer, but a fridge designated for fermented cabbage? Koreans are obviously very serious about their kimchi! So are Canadians apparently. Sauerkraut’s bolder, more adventurous cousin has been making appearances in menus across the country. Funky, fiery and with an addictive crunch, kimchi transforms a dull meal in an instant. It’s the perfect fusion food. Forget poutine, instead, try kimchi on top of fries. Hold off on the guacamole and put the piquant and salty cabbage in your cheese quesadilla for a zesty, spicy zing. How about a “kimcheese” sandwich (grilled cheese with kimchi)? You can also add it to stews, stir-fries, burgers, egg dishes, fried rice, and soups. Trust me — after you try it, you’ll want to put it on everything! Koreans (who eat on average about 18 kilos of it every year) have always known about the health benefits of their national dish. Kimchi is loaded with probiotics that aid digestion. Low in calories and fat, it’s loaded with Vitamin A and C to boot. It’s more than likely you have seen douchi (Chinese fermented black bean) in your Chinese takeout of stir-fry beef and peppers in spicy black bean sauce or black bean spare ribs. Not as popular as soy sauce in Chinese cooking, fermented black bean is nonetheless a staple among Chinese cooking enthusiasts. Take a whiff of douchi and you won’t confuse these tiny little black beans with the same black beans you use in Mexican cooking. Douchi is made by fermenting soybeans with salt and other ingredients like chilies and wine. The smell of the beans is both smoky and cheesy, with a bracing salty soy taste. When I think of cheese and salt, I think of Parmesan cheese. Could this be the Chinese equivalent? With the same umami burst that Parmesan brings to a dish, a tiny amount of douchi (a little goes a long way) injects life into any dish. Both fermented black bean and black bean sauce can be found at your local Asian grocery store, with the latter being a savoury and ready-to-use sauce blended with garlic and chili. Look for pliable beans, as they are an indication of freshness. Store in an airtight container in a cool, dry place. As it tends to be quite salty, most recipes suggest soaking the beans before using them. When using douchi, you should also add fresh ginger and garlic to the mix. The flavours of the aromatic garlic and the tangy jolt of fresh ginger are a perfect accompaniment to the complex notes of the black bean. Instantly brighten up everyday stir-fries, marinades, steamed or roasted vegetables by adding some mashed up douchi with garlic and ginger into your dish. Douchi makes a frequent appearance in Chinese seafood dishes as well. Wok-fried clams in black bean sauce, steamed oysters with garlic and black bean sauce are two popular ones. The distinctive salty taste of the beans, the aromatic garlic and the saline tang of the shellfish will have you hooked. If you have ever dined at a Japanese restaurant, more than likely you have had miso. However, it’s probably unlikely that the average miso soup served in restaurants uses unpasteurized miso, such as Tradition Miso. Husband and wife team Jerry Lewycky and Suzanne Cardinal have been producing Japan’s most favourite condiment in Claremont, Ontario for more than 16 years. Their mission is “to bring the ancient craft of producing fine miso to Canada.” Tradition Miso only contains certified organic ingredients — brown rice from Argentina, Canadian barley, Ontario soybeans, Portuguese sea salt, and good ol’ Ontario spring water. “We use a natural temperature process, whereas conventional miso is made using forced temperature. They put it in a hot room to speed up fermentation and add yeast. We don’t do that. Commercial miso can be made in two weeks; ours is made the traditional ancient way using natural temperature and no addition of yeast and aged up to three years,” Lewycky explains. When using miso, think outside the box. (Or, in this case, outside of the bowl!) Not only used for miso soup, it can be added to many recipes (they even have miso flavoured Kit Kat in Japan). Cardinal recommends using lighter miso in salad dressings, dips and a marinade for fish. For darker and aged miso, add it to heartier dishes such as soups and stews for that extra oomph of flavour. Despite its high sodium content, (those with hypertension should limit their intake or adjust the amount of salt accordingly in the recipe) miso is chock-full of health benefits. High in protein and rich in vitamins, Lewycky also notes, “our unpasteurized miso is a live culture, which contain[s] probiotics and has thousands of enzymes to help with digestion. Take it down south (Caribbean) when you travel and you won’t get stomach illness.” He also notes that “Samurai warriors used to bring miso with them on battles, it was an excellent protein source. It removes radioactivity, heavy metals and toxins in the body. It was heavily exported during the Chernobyl disaster.” In addition, miso is high in antioxidants and has been found to reduce the risk of breast, colon, lung and prostate cancer. With a long list of health benefits, miso is truly a nutritional powerhouse. Have you ever eaten something that tastes better than it smells? Well, add fish sauce to the list. Although it originated in ancient Greece and Rome, this pungent condiment is the backbone in Southeast Asian cooking. Fish sauce is made from two ingredients: salt and freshly caught small fish such as anchovies. The fish are packed between two layers of salt inside an earthenware vessel and left to ferment in a sunny location for several months. During this process the anchovies break down in their own juices. Nam plah (literally “fish water” in Thai) is extracted from the vessel, filtered, bottled and can stocked on the shelves of your local Asian grocery stores. Word of advice: Be extremely careful when transporting fish sauce home. If the bottle leaks, you, your clothes, your kitchen, your entire house be rendered intolerable. However, don’t let this deter you from using fish sauce in your cooking repertoire. Adding a few drops of this potent concoction to any dish brings intense complexity, be it to a dip, marinade, stir fry or salad dressing. When purchasing fish sauce, look for pale amber colour with no sediments and one packaged in a glass bottle (better tasting and longer shelf life than their plastic counterparts). Check the ingredient list. High quality fish sauce only contains fish and salt and is free from added water, MSG, and preservatives. Vietnamese-style fish sauce differs from its neighbouring Thai fish sauce, in that it’s lighter and less salty. The darker the colour, the stronger the potency of the sauce. Store the vigorous elixir in the refrigerator, it will keep for months. Luckily, “fish water” mellows out substantially while it is cooking, as it does when combining it with chili, garlic, lime juice and palm sugar (which creates Vietnamese nuoc mam pha). This tangy mélange is spooned onto everything in Vietnamese kitchens; as a dipping sauce for spring rolls and fresh shrimp salad rolls, to a “dressing” for Bún (vermicelli with grilled meats). However, fish sauce is not reserved for Southeast Asian cooking. Experiment with it. It is a staple in my kitchen; I use it as an alternative to salt and soy sauce. In addition, not only does it provide a tasty substitute for soy, it is good for your health. Fish sauce is full of vital minerals and nutrients as a result of fermenting the entire fish (organs, bones, meat, head, tails and all). In my humble opinion, without a dash of fish sauce many meals lack depth and end up tasting one-dimensional. Try it in recipes that call for Worcestershire (also made from anchovies). Add a few splashes when making soup to round it out. Alternatively, add a few dashes to salad dressing to perk it up and make it “Caesar-esque.” In lieu of salt, add a few drops to mashed-up avocado on toast. Include it at the beginning of the cooking process to layer the savoury complexity of a dish, such as in a Bolognese (fish sauce did hail from ancient Rome). Toss aside any doubts and reservations. Take the plunge and introduce “umami on steroids” to your kitchen. During my childhood lunch episodes, I always wanted to hide in a corner and eat my fermented meals in isolation. Today, I want to trumpet the flavours of fermented Asian condiments to the world. Sushi wouldn’t be the same without dipping it in the juice of fermented soybeans. Fermented fish water provides the essential savoury flavours found in a traditional Pad Thai. When we eat spicy chicken wings (preferably kimchi infused), who doesn’t love to wash them down with some fermented wheat or barley? The truth is, as smelly as fermented foods can be, we are all lovers (or closet lovers) of the stuff. It’s time to join the culture club. Bring on the funky and fabulous fermented foods of the Far East. If you are still a little apprehensive about trying any of the fermented items that I have mentioned, perhaps a cocktail is the best place to start. If Kim Jong-Un ever visited Canada, this would be the ideal drink for him. The quintessential Canuck staple with a Korean twist! I have replaced the vodka with soju (vodka-like rice liquor from Korea). This is a perfect way to use the leftover kimchi juices from the bottom of the kimchi jar and the dehydrated onion and garlic in the steak spice compliments the garlicky juices perfectly. Cheers! Place the Montreal steak spice on a flat plate. Rim your glass by running the lime wedge around the rim and dipping it in the spice. Fill glass with ice. Combine all ingredients in the glass. Stir well. Garnish with a wedge of lime, a pepperette stick, and kimchi (or whatever goodies you have in hand!) Sip. Repeat!